A spectacular $130m (£100m) "heist" at a bank in South Africa has provoked a furious political storm, revealing how deeply corruption is now entrenched in local government and beyond, and showing how hard it may be for President Cyril Ramaphosa's government to root out the graft and mismanagement that flourished under his predecessor Jacob Zuma. However, the story of the bank's alleged looting and destruction involves such a wide cast of villains and victims that it has the makings of an era-defining outrage - the scam that stretched from impoverished rural villages all the way to the upper echelons of government, and which now explains the perilous fragility of a nation's institutions. "Corrupt and rotten to the core," concluded Terry Motau, the lawyer appointed by the central bank to investigate VBS. He called his explosive report "The Great Bank Heist." And the political fall-out has been huge, drawing in the governing African National Congress (ANC) and the radical Economic Freedom Fighters (EFF). In parliament on Tuesday, the chief whip of the main opposition Democratic Alliance (DA), John Steenhuisen, accused members EFF members of being "VBS looters". EFF lawmakers reacted angrily, calling him a "white racist". A brawl quickly followed. For many years, VBS was a distinctly modest entity - a mutual bank, largely owned by its depositors, that helped rural communities, living on land owned by tribal chiefs, to secure mortgages or save for family funerals. Almost no-one outside the northern province of Limpopo had even heard of it. The bank's owners are accused of bribing local officials in some of South Africa's poorest and most dysfunctional municipalities - persuading them to divert, or to pretend to divert, their budgets into VBS's coffers in return for cash and gifts. They deny the allegation. "These people were stealing from their next-door neighbours - aunties, grannies. There is real anger about this. People want to see those people punished," said David Lewis of Corruption Watch. It was only once VBS was put under the control of South Africa's central bank in August that investigators discovered the full extent of the alleged looting and political intrigue. A total of 53 individuals and businesses have since been implicated in the destruction of a bank that had, for years, proudly boasted of its disruptive credentials as a black-owned business seeking to support "radical economic transformation" in an industry it claimed was still dominated by white capital. The "Heist" report lays most of the blame for VBS's collapse on the bank's leadership. But from the moment the authorities began to question VBS's actions and its liquidity, the bank insisted that it did not do anything wrong and painted itself as a victim of racism. "Our greatest sin… was running a successful black bank," wrote Mr Matodzi in a furious open letter to the central bank earlier this year. He said the bank's dreams of "radical economic transformation" were falling victim to an elaborate conspiracy led by a white-dominated banking sector "which does not tolerate growing black banks and black excellence." However, VBS's claims were swiftly condemned by a range of South Africans. "There is nothing black about this. This is criminality," said deputy finance minister Mondli Gungubele. "The looters have been using that phrase - radical economic transformation - as a pretext for years," said political analyst Prince Mashele dismissively. The "Heist" report quotes an alleged WhatsApp conversation that reveals the way VBS allegedly dangled cash in front of municipal officials to buy their loyalty. "We gave her 300k [$21,500] and she cried… We said we will consult with you and will sort her out," a middleman allegedly texted to the bank's chairman, in reference to a local mayor who apparently felt she wasn't getting a big enough "Christmas" present from VBS. 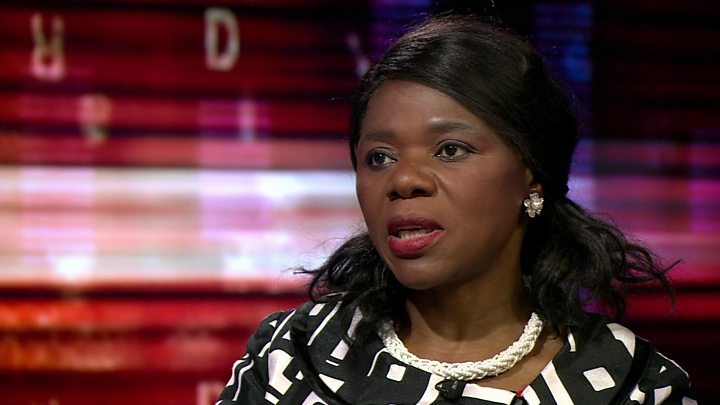 "Go ahead… but she must know the formula," Mr Matodzi allegedly replied. Mr Matodzi has denied the allegations against him, describing the report as "not balanced." South Africa's banking regulators have since announced that the 14 municipalities that invested about $113m in VBS are unlikely to receive a bail-out or compensation, leaving their struggling communities to bear the brunt of their leaders' alleged corruption. What has been the governing party's response? The African National Congress (ANC), which has governed South Africa since the advent of democracy in 1994, has tried to distance itself from VBS's troubles, condemning all those involved and ordering prompt disciplinary inquiries within the party. "We all agree this never should have happened," said the Minister for Cooperative Governance and Traditional Affairs, Zweli Mkhize, strongly condemning "the wanton fraud displayed in this saga". But the suspicion - fleshed out by recent newspaper reports - is that some of the money looted from VBS made its way into the ANC's coffers. "There is a toxic interplay between party and state. If the ANC doesn't move quickly and really come down on these guys I think it will cost them hugely at elections," said Corruption Watch's David Lewis. "The bloodsucking leeches and parasites that have fed off the savings of some of our country's poorest citizens must be held accountable," said DA MP Kevin Mileham. But in parliament recently, the party's deputy leader suffered the humiliation of having his own anti-corruption catchphrase - so often spat out against former President Zuma - directed back at him. "Pay back the money!" 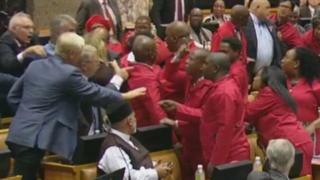 MPs from a range of parties shouted, gleefully, at the EFF's Floyd Shivambu. He has dismissed the allegations, saying at a press conference that it was "pure insanity" to claim he got money from VBS. Although neither man has been directly implicated in the "Heist," Mr Shivambu's brother Brian, who worked within the EFF, is named as the alleged recipient of about $1.1m for one year's consultancy work. Didn't auditors pick up the problems? When large, seemingly reputable organisations start to go rotten, they look to prestigious international companies - particularly auditors - to shore up their credibility and, on occasion, to provide direct help in covering up or facilitating their crimes. In this case, KPMG has once again hit the headlines after their lead auditor was condemned in the "Heist" report for accepting a lucrative fee but then failing to spot, or report, VBS's looming liquidity crisis. VBS "is corrupt and rotten to the core. Indeed, there is hardly a person in its employ in any position of authority who is not, in some way or other, complicit," said the report, recommending that KPMG pay damages for its role. In a statement, the firm said it had "already taken many steps" to deal with the issue and it welcomes the "independent scrutiny" of the regulatory board for auditors. Up to this point, VBS's behaviour could be seen as a localised, provincial, containable scandal. But in truth, it wasn't - or rather, the bank had ambitions far beyond Limpopo. "The Heist" report spells out in great detail how VBS sought to tap into some of the biggest pots of public money in the country, and came alarmingly close to succeeding. South Africa's Public Investment Corporation (PIC) controls some $143bn in state pensions and other social funds. The report shows how VBS allegedly bribed two senior PIC officials in order to gain access to loans that promptly vanished from the bank's fraudulent books and were instead handed out in new bribes. The full extent of the PIC's alleged involvement and exposure has yet to be revealed. Meanwhile VBS went after South Africa's giant railway utility, Passenger Rail Agency of South Africa (Prasa). And it is here that the process becomes explicitly linked to national politics, and to a furious power struggle between factions within the ANC. But it seems there was one, crucial, factor which would determine the scheme's success - the result of an ANC leadership battle, which VBS hoped would be won by Mr Zuma's preferred candidate. When, instead, Mr Ramaphosa won an election in December to lead the party and, later, the nation, the attempt to lure Prasa into VBS's alleged scam apparently stalled. That loan, it is alleged, was a turning point for VBS, signalling its willingness to be drawn into the ANC's national power struggles - between Mr Zuma, and the man who would soon replace him, Mr Ramaphosa. The report details how VBS money was allegedly paid to Mr Zuma's own family foundation. Perhaps significantly, the bank's subsequent claim that it was trying to promote "radical economic transformation" was a phrase lifted straight from Mr Zuma's own increasingly populist rhetoric, as he sought to prevent Mr Ramaphosa's faction from gaining power. For a while, it looked as though thousands of rural investors - who angrily besieged VBS branches in Limpopo fearing that the money they had saved for mortgages and funerals - would lose everything when the bank went into administration. More broadly, it is important to note that South Africa's regulatory authorities did do their job. Something similar happened at Prasa, where a courageous official refused to go along with alleged "political" plans to funnel cash into VBS.